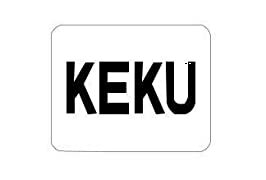 Sold by KEKU and Fulfilled by Amazon. Gift-wrap available. 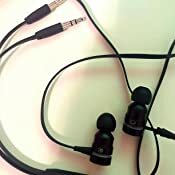 WIDDE application: Use extension cord, desktop adapter and microphone, sports headphones can not only with the most common mobile phones, such as iPhone, Samsung, iPad, Google with the use, but can be used with PC, notebook computers, compressors. 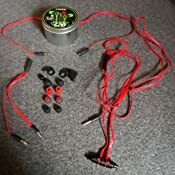 Comfortable sports: These earplugs are made of memory cotton and provide an inner earring that makes it comfortable for the ear. Do not worry about walking, yoga, reading, thinking and relaxing. 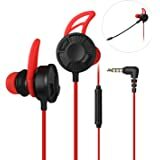 Decent sound and high fidelity performance: the sound quality is very good, and to prevent the fact that external noise left you a deep impression. 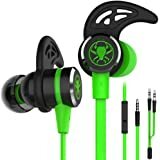 Strong bass stereo makes the beat more energetic and activates you during the sport. 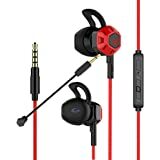 Start enjoying live music with these stereo headphones in headphones! 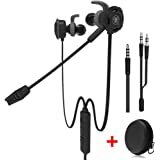 Good headphones ipod, iphone, mp3, ipad, tablet and Android device. Common for everyone's ear: Packed with 3 pairs of inner rings and silicon earplugs (large, medium and small). So this headset can be used by everyone, do not worry about the size. Full length cable length: total cable length up to 2.2m. As a result, headphones with a microphone can fully meet the player's requirements during the game. Sold by KEKU and ships from Amazon Fulfillment. Sold by Maxin and ships from Amazon Fulfillment. stylish design, bring you a new experience and feelings. It blocks out the outside noises really impressed game players. HiFi performance make you feel immersive when you play games. Noise cancelling stereo bass increases your sense of picture.Magnetic design allows you to better storage, to experience more fashion. I must say these earphones blew my expectations out the door. For a little background on myself, I play rainbow six siege and have used turtle beaches and PS gold headsets. 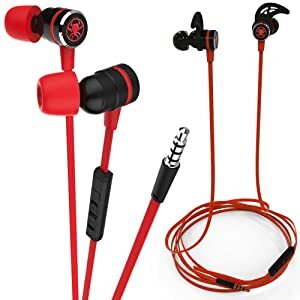 I’d say these earphones rival the two in sound quality and you can adjust the mic position with the little clipper that it comes with. For $15 this is easily the greatest bang for your buck in gaming. The best part? I can use them on my laptop and phone just as easily as I can use them on my ps4. Just plug them in and you’re good to go. I got my buddies to order some and they’re happy with their decision. I hope you, the reader buy some and it goes well for you as well. I cannot recommend these enough and will be buying more in the future just to have a pair in certain parts of the house or in my car. So far, so good! First, I love the color options for the ear buds, though I do wish they'd made the red, squishy ones a lot smaller. My ear holes are on the really small side, so even the smallest ones don't stay in super well. 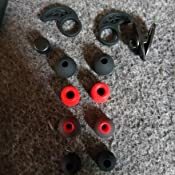 I tried but the small, black ones and the translucent black with red ones, and the latter worked better. They're aren't any instructions for what some of the extras do, like what the tiny, round, black piece is for. I also wasn't sure about the noise cancelling pieces, but am fairly certain it goes on like I have it for the right side. Unfortunately, the bud doesn't stay in with it like that, so having it like the left is my only option. They're made of silicone, so you don't have to take the bud pieces off. The main cord is actually really long, more than expected! I'm glad for the clip, so I can clip some of it out of the way. I also really like the extension (definitely won't need that for regular use!) and dual port. The latter is one I could take to work, and share my music if a coworker forgot theirs. The sound is really good too. The volume slider is legit, and having it all the way minus is basically the mute button, so that's cool. I'll know more tonight on how well the noise reduction, comfortability, and sound/bass are. So far, I'd definitely buy again! After using these for a few weeks, I must say how impressed I am with the bass, even when only using one earbud. They do get uncomfortable after awhile, but I would definitely buy these again. 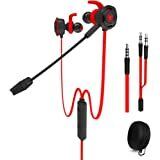 5.0 out of 5 starsGood earbuds! 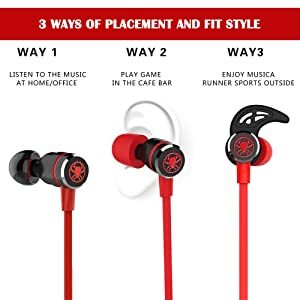 Pros: This is a good earbuds. 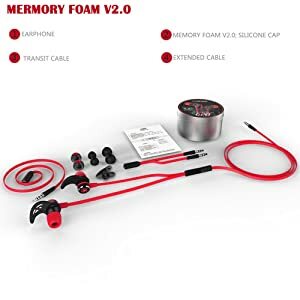 I bought this cuz I'm tired of using headsets, which are too heavy and clamped my ears so tightly that headsets made me really uncomfortable especially when I use it for over 1 hour. 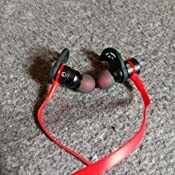 Therefore, I bought this earbuds: the weight is much less than regular headsets and it is good for long-term movie watching and gaming without any unconfortable feelings. The sound is clear, and when u using, u basically cannot hear your parents calling ur name. The cables are robust enough, as I can tell. Cons: (1) Bass is a little bit too much, but it is fine. (2) The adapter is good, but cannot be used for iPhone earbuds, as I tried: when u put an iPhone earbuds into the adapter, u can hear but u cannot speak. Original review below. 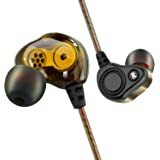 Update Review - After only a month of use, one of the earbuds has failed completely. I had resigned to using them during weight training instead of cardio due to how poorly they held in place and now they are in the trash. 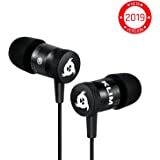 If you are even considering these, they sounded great when i first got them, but then the issue with them staying in ear cropped up, and now they are done, for the price it isn't worth it. sound great but don't stay in ear very well no matter which end piece you use, even with the in ear hooks. 5.0 out of 5 starsMy son loves them for gaming. 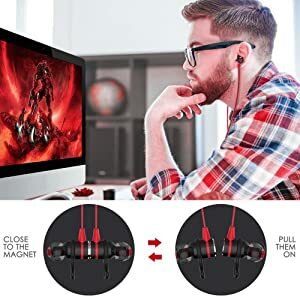 My 15 year old is really into gaming on his PS4 Pro, and was looking for a new set of gaming headphones that had a mic. These were a great low budget solution for us. 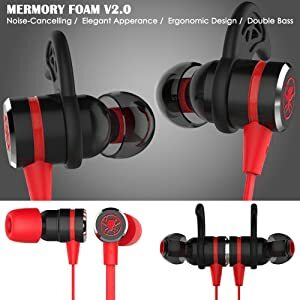 They are noise cancelling and you really can't hear any background noise when you have them in, but this function only works with the foam type ear buds that are attached to the headphones when you get them. There are other ear bud attachments as well in the tin, but they will let in some noise. The foam ear buds are amazing though, and he loves gaming with these earphones. There are multiple attachments that come in the package, and the package itself is a neat little tin that makes storage of everything easy. If you are in search of a low cost gaming headset, these are a good choice.